We love easy meals here at our house. If there’s a way to make a delicious, but very easy meal? I’m there. 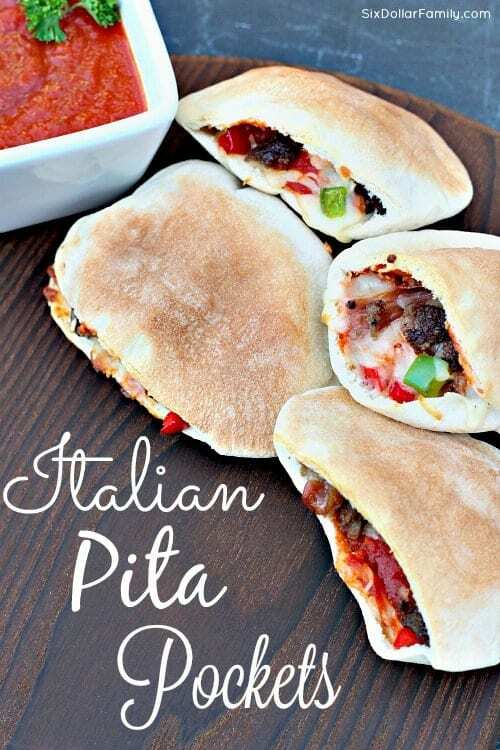 This Italian pita pocket recipe fits that bill! They’re quick and easy but they’re oh so good! 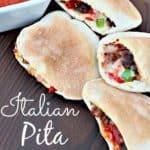 We make ours as an Italian meatball flavor, but really, you could make them with any toppings that you wanted to create a meal that each member of your family will want to eat.These Italian Pita Pockets are fantastic for any family movie night as an alternative to pizza since they’re so easy to make! This is my second favorite go to meal because of how easy it is to make. My first favorite is my slow cooker chicken thighs recipe simply because it’s dump and go. These do take a little bit of time to put together but they’re so worth it and homemade pizza takes more time than these! I have no doubt in my mind that you will love them every bit as much as we do! Like I mentioned above, we do these in an Italian style with meatballs and the works. They taste a lot like a meatball sub only better! 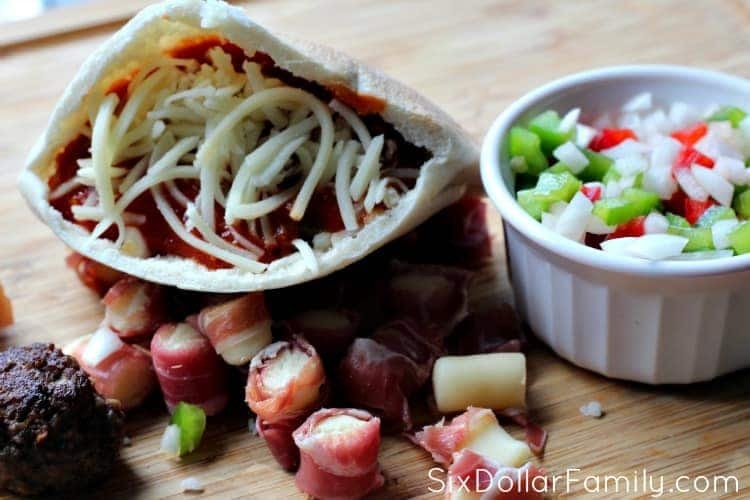 If you aren’t digging on the Italian flavor, you could easily do these as a pepperoni pizza pita pocket, a ham and cheese pita pocket or even a broccoli and cheese pita pocket! The sky is the limit and you are only limited by what you put in yours! Preheat your oven to 350 degrees. While the oven is heating, brown the meatballs in a medium skillet then finish baking them in the oven on a cookie sheet. Once meatballs are finished, place on paper towels to absorb excess grease, quarter each one then set aside. 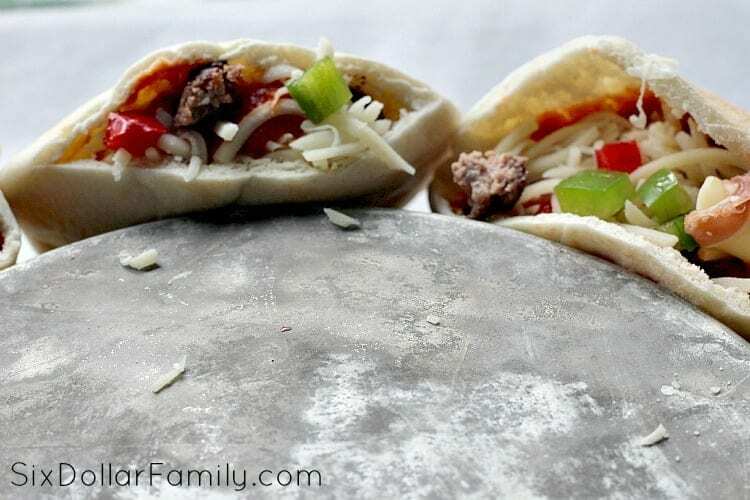 Quartering the meatballs makes it easier to stuff your pita pockets, but you don’t have to. In fact, my Tom prefers his whole. 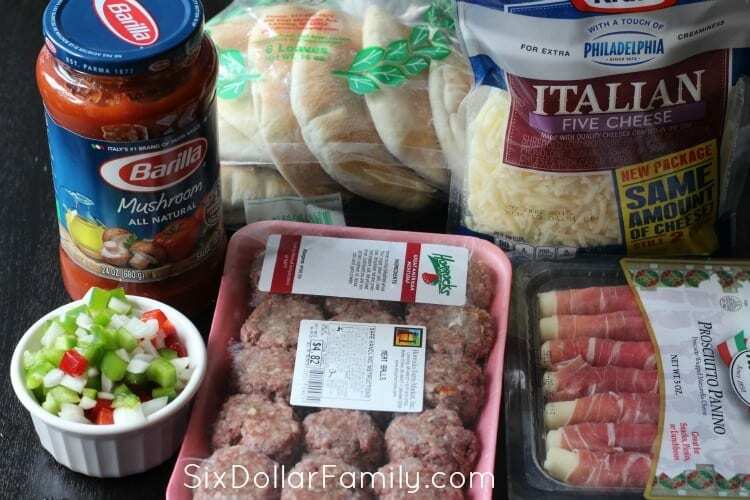 Remove the prosciutto panino from package and chop in 1/2″ pieces then set aside. Dice the onions and peppers. Set the veggies aside and using a pair of sharp kitchen shears, cut off 1/4″along the edge of pita bread to create your pocket. 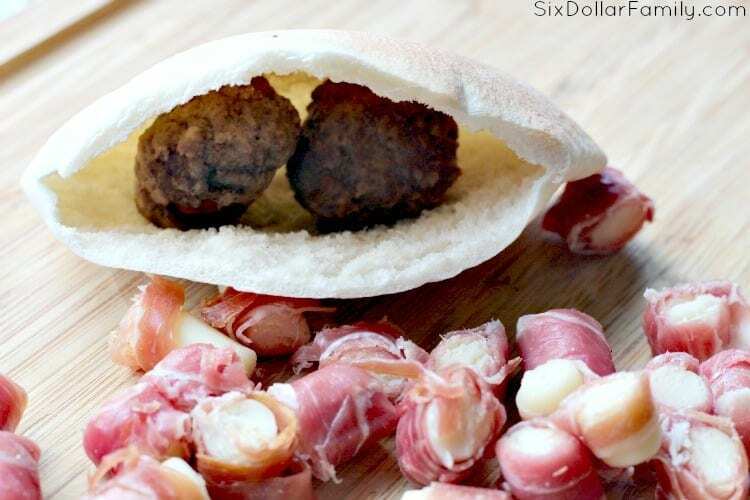 Open the pita pocket and stuff with both the meatballs and the prosciutto panino and top with a spoonful or two of sauce. Top with shredded cheese, diced peppers and diced onions. Make sure that your pita pockets are really stuffed full of ingredients. 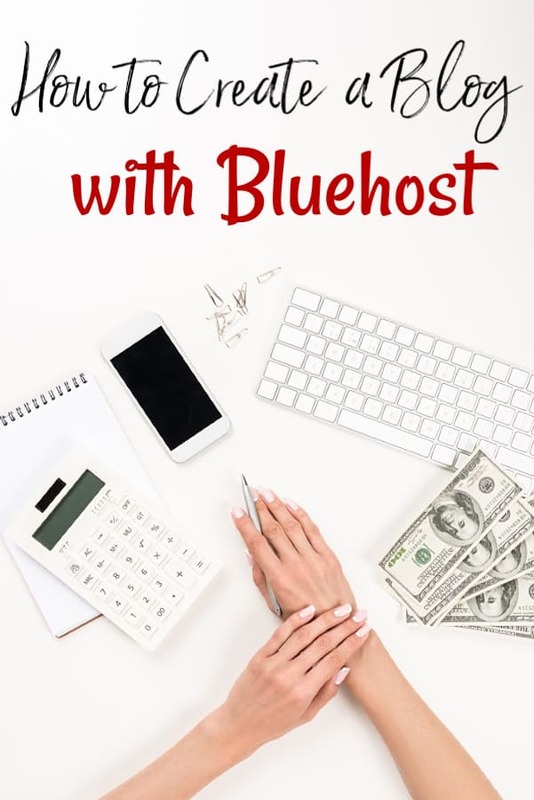 Bake for 15 minutes in a 350 degree oven using a 9-10″ cake pan that you have turned upside down and placed in the center of a cookie sheet. You’ll want to arrange your stuffed pitas upside down around the cake pan so they are standing up to keep any toppings from falling out. Garnish with parsley and serve with marinara sauce on the side. Eat hot and enjoy! 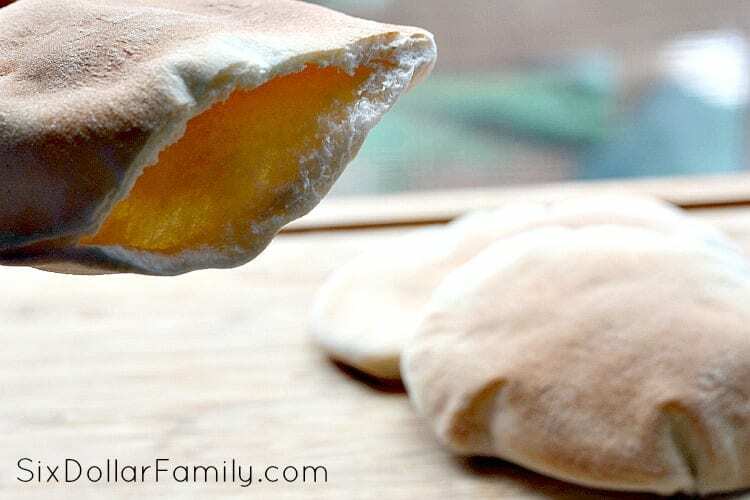 Perfect as a meal or just a mid-week lunch, these Homemade Italian Pita Pockets are super easy to make, filling and have a taste that will have you begging for more! 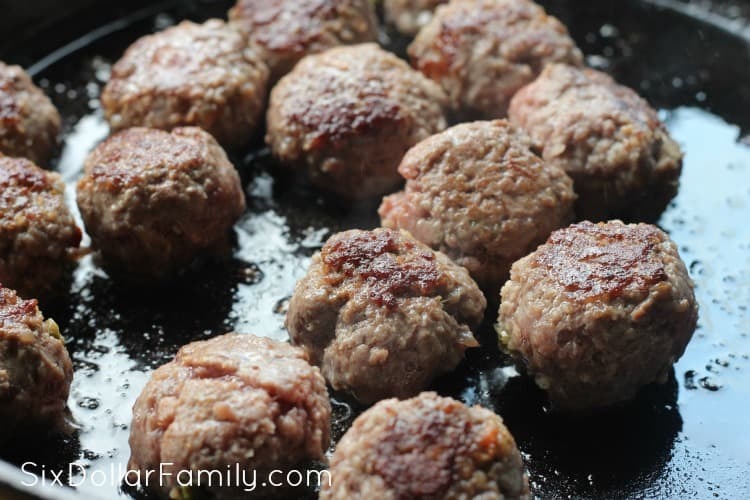 In medium size skillet brown meatballs, then finish cooking them through in a 350 pre-heated oven. Once meatballs are finished, place on paper towels to absorb excess grease. Set aside. 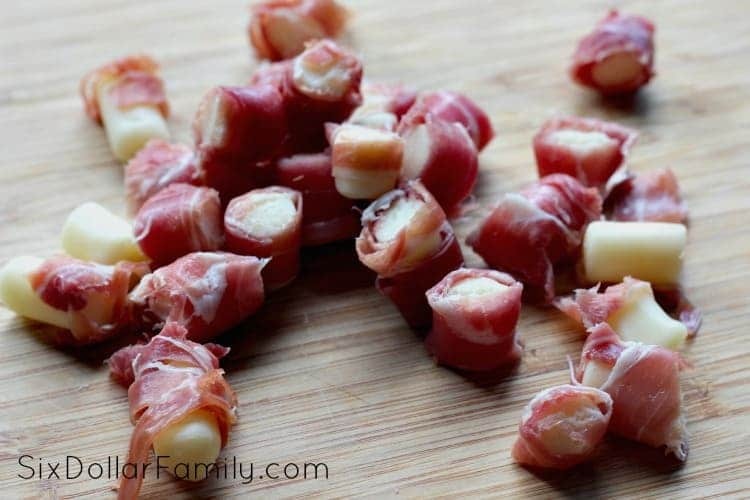 Remove prosciutto panino from package and chop in 1/2" pieces. Set aside. Dice onions and peppers and set aside. Take a pair of clean kitchen shears and cut off 1/4"along the edge of pita bread. 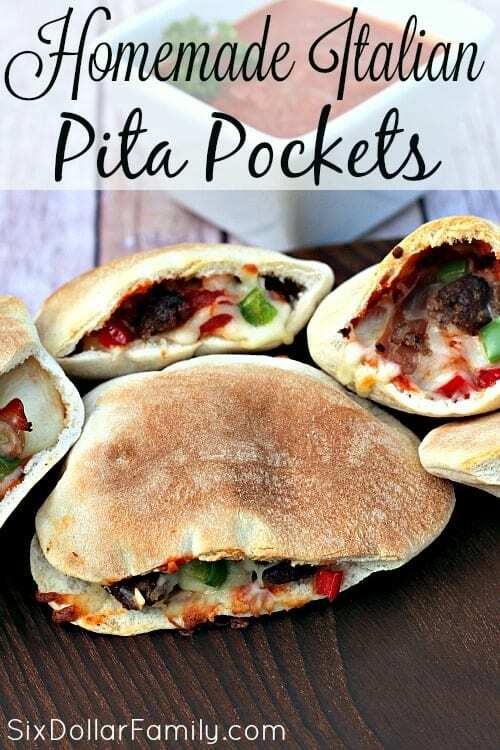 Open the pita pocket and stuff with meat, veggies, cheese and marinara sauce. For best results bake using a 9-10" cake pan turned upside down and placed in the center of a cookie sheet. Arrange stuffed pitas around upside down cake pan so they are standing up. Place in a 350 degree pre-heated oven and bake for 15 minutes. Garnish with parsley and sever with marinara sauce. Note: You can leave meatballs whole, cut them in half or quarter them depending on your preference. Quartering the meatballs allow for a greater distribution within the pita pocket.